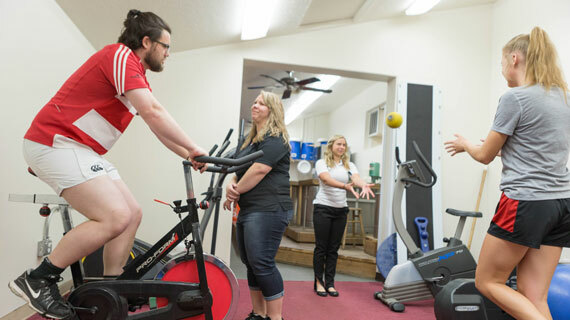 According to the College Affordability Guide, Southern Utah University’s Master of Science in Sports Conditioning and Performance (SSCP) is ranked number 11 of the top 14 in the country. College Affordability Guide launched in 2013 and has become one of the most trusted online resources for students interested in saving money on their education. The ranking is determined by institutional fit, financial aid and graduation. Institutional fit looks at the fundamentals first - not-for-profit status, at least 500 total students, associate or higher degrees, and at least one non-standard way for students to earn college credits, such as AP or ROTC credit. Financial aid looks for the most affordable schools and equitable use of financial aid money. Graduation takes into consideration completion rates, as well as students with debt who are actively paying it down three years after they graduate. The SUU MSSCP Program is a National Strength and Conditioning Association (NSCA) “Educational Recognized Program” (ERP). The NSCA is widely considered the world’s premier organization committed to advancing the strength and conditioning discipline. The NSCA ERP focuses on the quality of a university’s program curricula, credentials of the faculty, and scholarly outcomes of the faculty and students. “When you consider the MSSCP program is nationally recognized for educational excellence as well as a top ten fiscal value, I think people would agree that our program has a unique brand and is a true stand out,” said Mark DeBeliso, director of the MSSCP. For more information, visit the Department of Kinesiology and Outdoor Recreation.